Copyright : Tom Hua, 2002. Welcome page : About ClickBank.com Accept Credit Cards with No Monthly Fee. 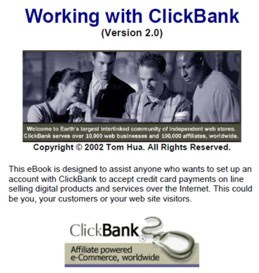 ClickBank is the ecommerce solution for thousands of web businesses that deliver unique products and services over the Internet itself (via web pages, files, or email). ClickBank's payment technology lets any web business (a seller) automatically pay sales commissions to any other web business (an affiliate) that links a paying customer to the seller. Clickbank bills the customer, pays the seller, and pays the affiliate. By acting as the trusted intermediary, ClickBank maintains complete security and quality control in every transaction. ClickBank offers significant advantages over any stand-alone solutions for billing, marketing, or affiliate management: Affiliates can freely link to any seller and be assured that they will be paid for every sale they generate. Sellers can freely accept new affiliates without fear of fraud or misrepresentation. For sophisticated international fraud control, ClickBank uses ccScan to screen all purchases. For maximum card security, all orders are sent directly to the banking network for immediate authorization. We do not store card numbers.